A friend sent me a link to a recent WRAL article posted yesterday about a fatal collision in Cary on Sunday, February 12th1. Tragically, both passengers in a left-turning vehicle died when the driver crossed the path of another vehicle. This is terrible and my condolences go out to those affected by the incident. I also feel for safety engineers everywhere who feel the emptiness of failure at each reported fatality2, especially the highway safety professionals who work in this jurisdiction. However, as an engineer and scientist it is of utmost importance to step back and remember a few things about working within the confines of the real world: with limited tax funds, systems are imperfect and not every collision is preventable. 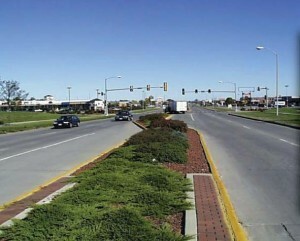 Keeping these things in mind, how do traffic engineers decide if an intersection requires a traffic signal? We use a system of “warrants”, or reasons that warrant the installation of a control device. The Manual on Uniform Traffic Control Devices (MUTCD) lists nine signal warrants for varying reasons in Chapter 4C. A pdf of this manual can be found here. These reasons range from volume to school-zone related conditions and yes, even crash experience.4 Most generally, traffic signals are never installed without first qualifying for one or more warrants. Why? In many cases a signal can make an intersection worse than it started! Traffic signals are often viewed in the public eye as a cure-all, when in fact they can have adverse affects on safety and efficiency: increased delay, increased traffic control disobedience, increased use of other routes such as neighborhoods (just to skip the light! ), and others. The increased stops can also increase the number of rear-end collisions at the site as well.4 This has led to the installation of many lights that were never needed, at sites that may now be less safe, at the cost of a six figure installation. 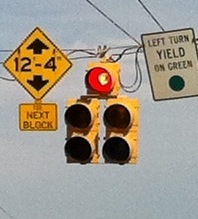 Thats right, your average 4-way simple traffic signal costs between $150,000-200,000. Plus continued maintenance from now until forever. “People have begged on hand and knee, offering to sacrifice their first born for just one, ONE traffic signal. The site would be safer, and this wouldn’t have happened”. No wonder people think traffic signals are a cure-all! This conjecture could be patently false. For all we know without adequate evidence, adding a traffic signal could make this site WORSE. But not now. As uninformed citizens we now know that the evil city of Cary is denying us the promise of safety and security that only a traffic signal can bring. This one earns the reporter kudos. Notice how quickly and easily the blame of the incident could have been shifted: 1) “she unwittingly pulled in front of traffic”, or 2) “the Dodge Avenger smashed into the side of her vehicle”. Unfortunately for the reader, we don’t know the exact cause of the collision. We may never know for sure. It could’ve easily been texting or another form of distracted driving. The author calls this collision “correctible”, though as a reader we are left unsure as to whether or not it is she or her interviewee that thinks it’s correctible and why. But by calling this collision “correctible”, the public will be wondering why correctible collisions are happening at all. And they should! But they are missing an important piece of the puzzle: some intersections are more correctible than others and warrant more immediate attention and funding, of which there is a finite amount of both. As much as a I try to avoid reading the comments section on a news website, it’s important from a public administration point-of-view to see how this fraction of the populace thinks. Some comments are enlightening, some are sad. This time, I was mostly surprised to see intelligent debate in the comments section. Mostly. Here is the advocation that, not only should tax dollars be spent willy-nilly by those in power when they find misfortune, but that politicians should make engineering decisions. There is a problem when the politically inclined try to mingle in the affairs of those who put safety first, a perfect reason why engineers should use MUTCD warrants instead of bending to political pressure from above. While my first instinct is inclined to agree, sight distance plays an important factor in intersection design, and it may need reinvestigation at this particular intersection. Though I imagine it was addressed and not seen as a big problem during the original design, factors such as reclassifying the speed-limit or increased volume year-to-year could play a part in changing the environment here. If a light is installed in the near future, I hope it will be because it is warranted and that conditions have changed since the last inspection of the intersection. Not because of the ravings of uninformed watchers of the 6 o’clock news. We should all strive to be more cognizant of the impact media can have on the heart of the public, and how important good communication can be when working for the public sector. These efforts will make it easier to limit the affect of a tragic story in the news from opening our wallets too wide when there aren’t enough collisions to merit a new, expensive, and possibly ineffective traffic control device. Traffic signals are not a cure-all; sometimes, when not really needed, they cause problems. We use Signal Warrants to come to justified conclusions, recommended by the MUTCD, on whether or not to add a traffic signal at an unsignalized intersection. MUTCD has 9 different signal warrants for varying reasons of safety. Intersections do not require collisions to warrant a traffic signal. “Pleas from drivers and neighbors” is not an MUTCD signal warrant. “The mayor found misfortune” is not an MUTCD signal warrant. Crashes and fatalities do not necessarily merit an MUTCD signal warrant. Mental Note: Prevented collisions never make the news. How could they? Mental Note: Drivers and neighbors are an invaluable resource when discussing what they think of an intersection. However, everyone’s seen a collision somewhere. This does not always, a “dangerous” location, make. Manual on Uniform Traffic Control Devices 2009, published by the Federal Highway Administration. As found in the Highway Safety Engineering Studies Procedural Guide, published by USDOT and FHWA 1991, commonly referred to as “The Parker Manual”. Hot on the heals of budget deals, deficit raising, and spending cuts in Washington comes a report from the American Society of Civil Engineers saying that our failing infrastructure will impact the US Gross Domestic Product by 2.7 trillion dollars by 2040. All due to funding gaps between what we use and what we actually pay to maintain. This will cause 400,000 lost jobs, lower incomes, lower spending, and lower exports, worsening the US trade position. Transportation is quite possibly the MOST important infrastructure to a first world economy, it would be a shame to have made decades of investment to watch it crumble. Care about your transportation systems? Vote accordingly and write your congressmen, both local and national. The following is an email I sent to Wake County Representatives, concerning the issue of legislation-run engineering. If you can, write something similar RIGHT NOW to your representatives. A list of NC Representatives can be found here. Here is a list of NC Senators. I live in Wake County and I work in the engineering field. I’ve been made aware of H561, a bill to supersede engineering safety design decisions made by engineers at NCDOT. I urge you to NOT back this bill. It is not based on facts, research, or scientific credibility, but on fears of change. It has been well established in the engineering community that highway medians substantially increase driver safety and save many lives every year without impacting local businesses. Over 30,000 people will die this year in the U.S. from motor vehicle collisions. We cannot set a precedence of State legislature overseeing every engineering decision made in the name of public safety. Do we remove stop signs when businesses ask? Do we remove bridge supports when someone finds them unappealing? That is, in essence, what some are suggesting: taking the complaints of the uneducated few and using these complaints to stifle progress in public safety and safety awareness at the cost of human lives. I have a write up on my website with more details. Mike Roselli is a graduate of the NC State Civil Engineering Department. This writing reflects the views, opinions, and judgement of the author and does not necessarily reflect the views, opinions, or judgement of NC State University or NCDOT. Today, the News and Observer reports that the State Senate will be voting on House Bill 561, to require NCDOT to remove a half mile of center median installed on new projects in Asheville, NC, “at a cost estimated by NCDOT at $797,500”, and to give the State legislature power over road design for other projects. Other than ripping up a nearly completed project to nullify the design, the legislation would force DOT to change widening plans and forget other median installations planned on other routes. The fact that politicians, who know next to nothing about road design, can be influenced by their constituents to change engineered designs is unfathomably horrific. Restricting left turns is good for safety. Median installations that require drivers to plan their left turns and u-turns at a limited number of intersections increase road safety by decreasing all sorts of collisions and allowing traffic to flow more smoothly. The decisions made in these designs were based on safety. So who has a problem with this? Well, access restriction is seen by many locals as harmful to businesses, despite some studies showing evidence to the contrary. The latest is by a research team here at NC State and UNC, titled “Economic Effects of Access Management Techniques in North Carolina”. I’ve attached the study and you can download it here. The study confirms that little to no evidence of economic problems was found after the installation of turn-restricting medians. Additionally, it’s important to note that drivers are more aware of road safety than they think. And in fact, some drivers may be more inclined to use your business if they feel safer about entering and exiting the access to it. The Federal Highway Administration has a great write up on safe access and what it means for businesses. I’ve attached it and you can read it here. This is a problem. It is a sad day when engineers who make sound decisions based on data can have their life-saving designs overseen and rejected by bought elected officials in the name of cheap tricks and politics. Bottom line? Let engineers do their jobs. And write your representatives an email and tell them. I did. It seems the Senate has delayed voting on this issue for now. I’ll be posting more on this as it develops.